As more homeowners think of their outside space as an extension of the interior of their home, they often want to use the outdoors for two seemingly contentious goals: relaxation and entertaining guests. 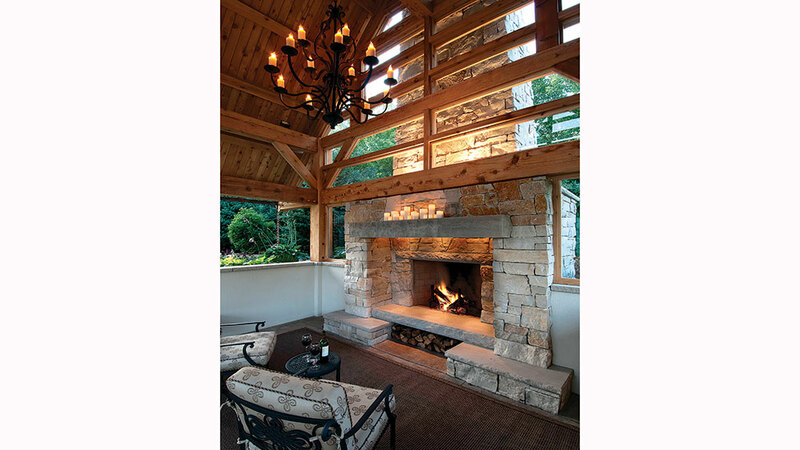 While open decks and rustic screened-in porches function perfectly for personal relaxation, they do not lend themselves to the space or aesthetic requirements needed for a more formal entertainment area. With a little creativity, homeowners don’t have to choose between the different roles they’d like their space to play. Chad and Marla Hunter found themselves in this situation after finishing their home near the shores of Minnesota’s Lake Minnetonka. Once the house was complete, they turned their full attention to the outdoor living and entertaining that they wanted to do beyond their four walls. They often use their home for large summer parties, so they liked the protection from the elements that a gazebo would provide. But they considered a traditional gazebo too confining because of the lack of accessibility and the restrictions it placed on the views of their beautifully landscaped natural setting. Knowing the ambiance they wanted but not exactly sure how to achieve it, the couple tried several different designs, only to rip them up and start from scratch. They also had trouble deciding how to create a formal outdoor space where they could entertain but that wouldn’t look totally out of place. They started with the setting. “We wanted to make the landscaping look like it belonged there,” Marla Hunter says. Landscape architect Laura Baxley of Anthemis Landscape Design transformed the boggy terrain into a stunning organic canvas that incorporated natural flora and created a seamless landscape for the home. 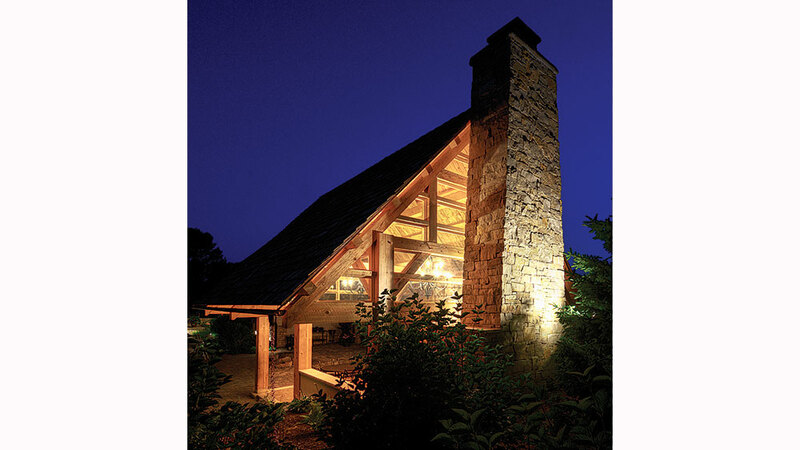 Her architect husband, Bill Baxley, came up with the idea of using an open timber-frame structure that would complement, and provide access to, the natural design of the area. He also suggested designer Paul Linnebach of Mantis Design + Build. “Paul was able to move (the broad ideas) from concept to reality,” Chad says. 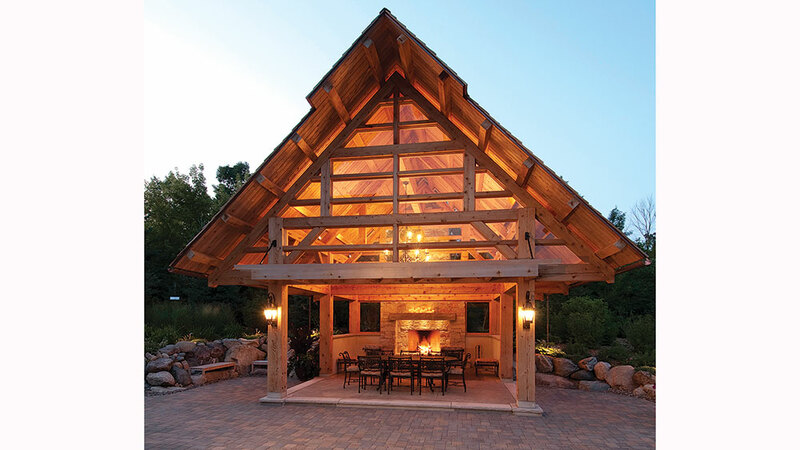 The designer brought in Doug Beilfuss as the master timber framer on the project, and the two worked with the Hunters to create an adaptable living space that works well for a variety of functions. The structure fits the surrounding area perfectly. The 18-by-22-square-foot gazebo features a huge stone fireplace, a casual sitting area and a formal dining table with seating for eight. Overhead, two chandeliers add luxury to the relaxed feel of the structure. The couple wanted an open-air framework that would allow for easy movement and unhindered views, but a persistent north wind made a totally open structure too uncomfortable, so the team installed glass panels on either side of the fireplace to extend use into the spring and fall without compromising the view from any angle. The surrounding terrace flows easily into the neighboring landscape, and a drilled boulder water fountain adds a Zen-like touch to the atmosphere. When Chad has friends over for football parties, the Zen takes a backseat to a large television. 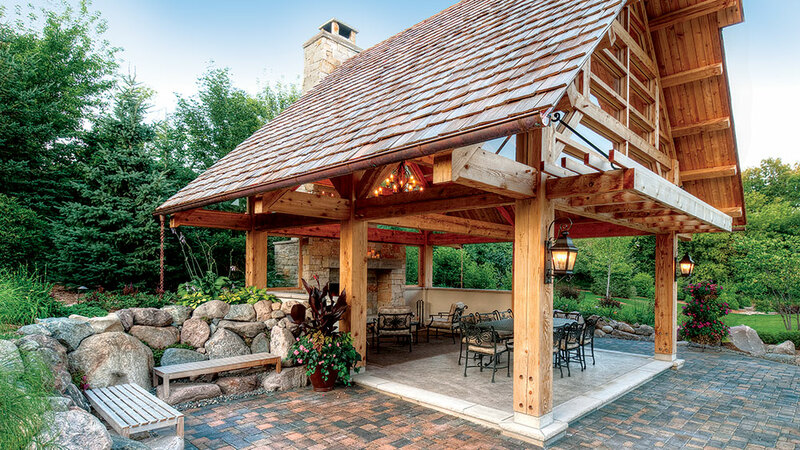 The owners painstakingly designed this gazebo to mesh with the natural landscape. 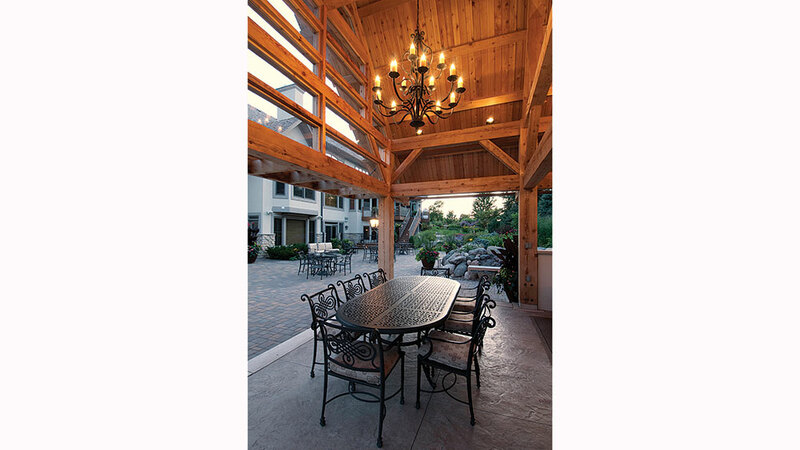 With seating for eight, this structure works equally well for casual barbecues and formal dinner parties. The 8-foot-tall hearth helps block the cold north wind and allows the owners to enjoy the setting well into the chillier months. 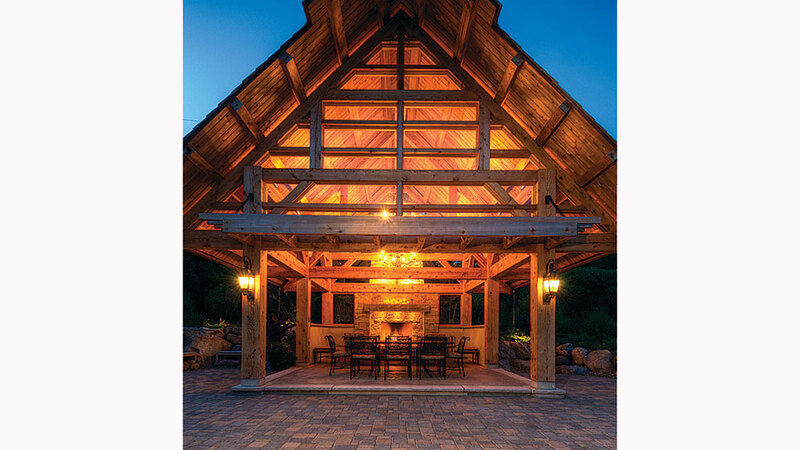 Ground lighting helps illuminate the gazebo, while sconces and two chandeliers give it a welcoming glow from within. A flowing water feature drilled from a huge boulder helps accentuate the relaxed atmosphere of the space. A spacious terrace, ringed by large boulders, extends the outdoor living area beyond the more protected refuge the gazebo offers. 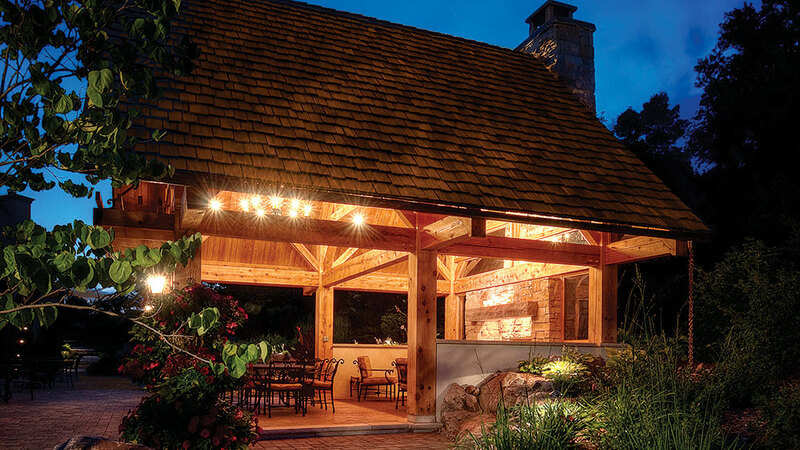 Gable-end windows bring lots of light into the sheltered structure while keeping the gazebo more insulated than a totally open design would allow.